OOPS! 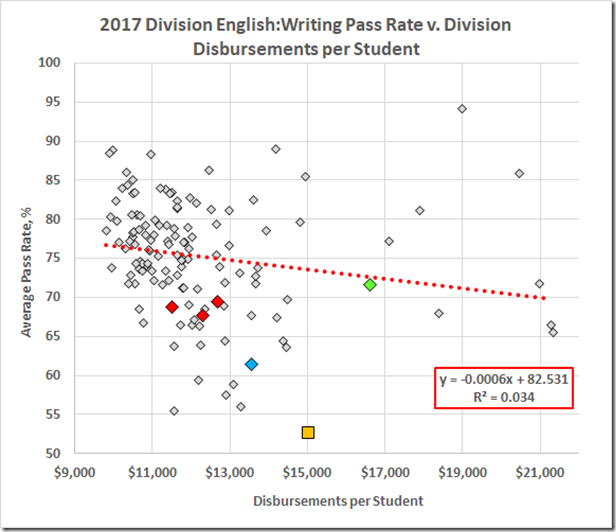 A kind reader points out I messed up the totals in this post. 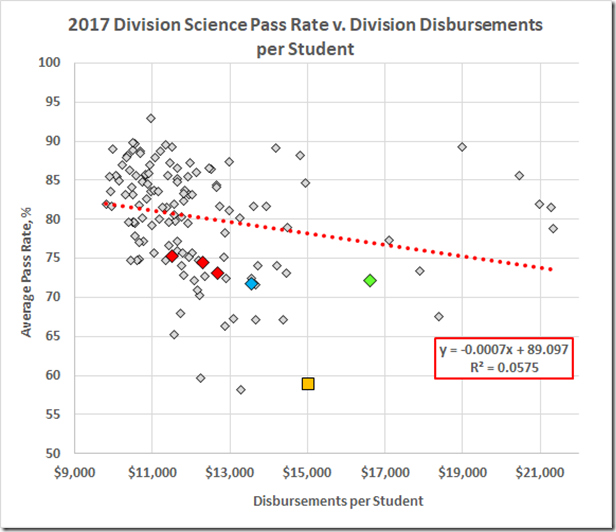 The State spreadsheet has a column for the day school total and I included that in the grand total, double counting the day school total. 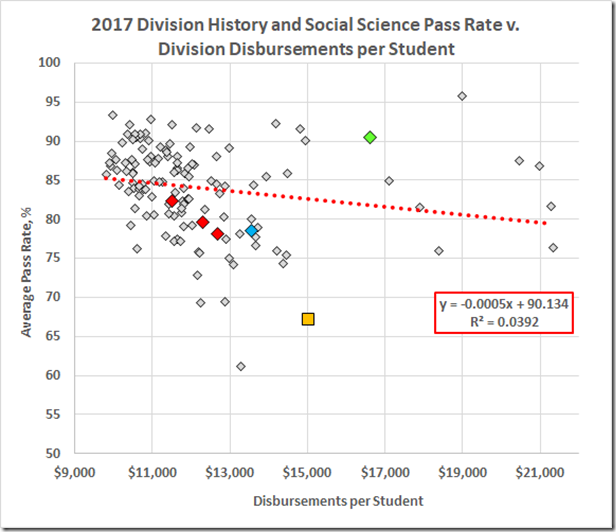 Now that VDOE has posted the division disbursements for 2017, we can juxtapose those data with the 2017 SOL scores. 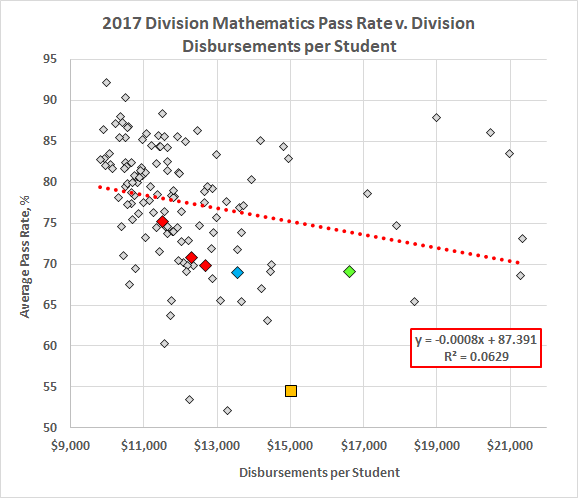 For purposes of this exercise, I’ve left out the amounts for facilities, debt service, and reserves because of the wide variation of those numbers between divisions. The numbers below, then, are the totals for the regular day school operations plus food services, summer school, adult education, pre-K, and “other” educational programs. 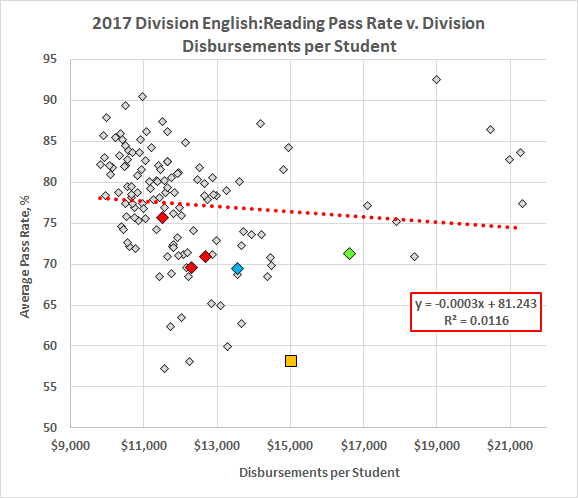 To start, here are the reading pass rates v. those disbursements. 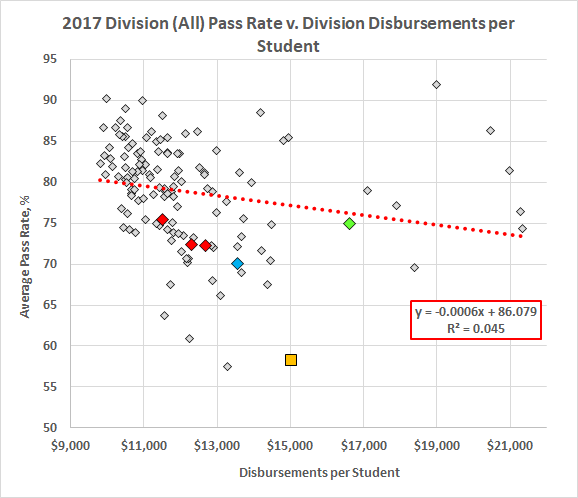 The fitted line might suggest that pass rates decrease with increasing disbursements but the 1.1% R-squared value tells us those variables are very slightly correlated. Richmond is the gold square on the graph. The red diamonds are peer jurisdictions, from the left Hampton, Newport News, and Norfolk. Charles City is green; Lynchburg is blue. The average disbursement is $12,216. 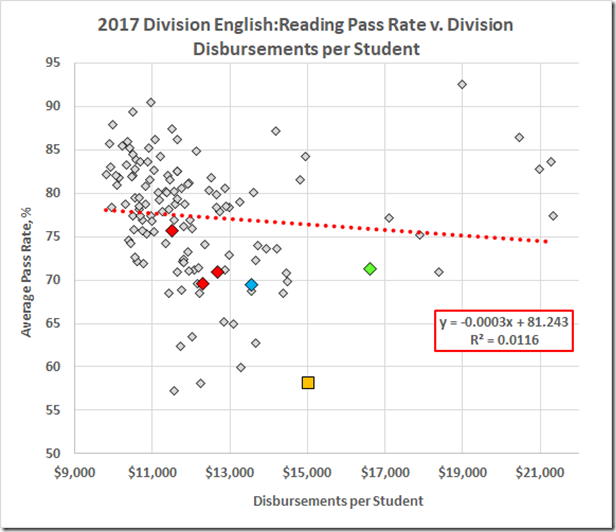 The average reading pass rate, 77.4. 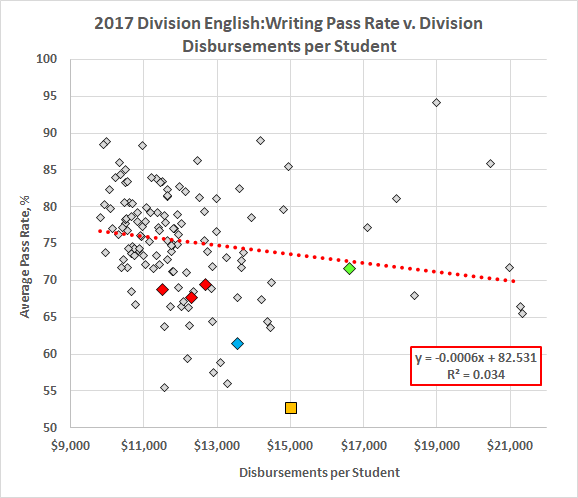 Richmond spent an extra $2,804 per student for an SOL return 19.3 points below the state average. And here are averages of the five. These other correlations are larger, up to the 6.29% in math, which is an R of 0.251. 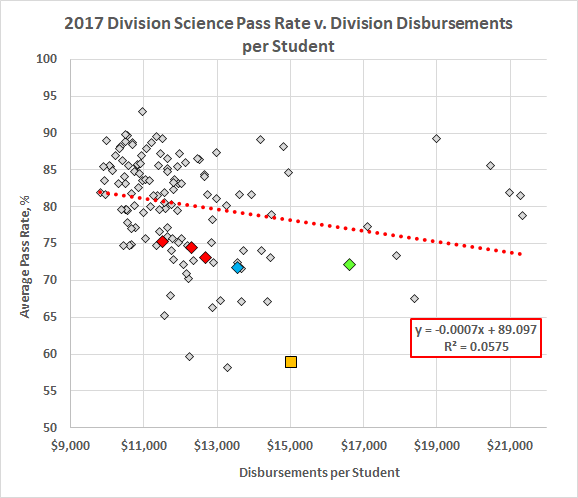 From eyeballing the graphs, it looks like it’s driven by that flock of divisions in the upper left that gets better than average pass rates and spends less money than average. And, as to Richmond, the result is clear: We’re spending a lot more money than average and we are competing for the lowest pass rates in the state. Let’s hope the upcoming audit by the Council of the Great City Schools will tell us where all that money is going in Richmond and why it gets us such awful results.